Chandrapur (Maharashtra), April 5 (IANS) Congress President Rahul Gandhi said on Friday that the party's proposed Nyay scheme would "kickstart the economy to full steam" and bring it back on the rails. Addressing an election rally here this evening, the Congress chief said the party's well-thought out plan to give Rs 72,000 directly would benefit 20 per cent of the country's poorest, or around five crore families, and prove to be a game-changer. "Only after it was vetted by global and Indian economic experts, we have announced it in our manifesto. It can be implemented without imposing any additional tax burdens on the country's population," Gandhi said as the crowds roared in approval. Explaining the benefits, he said once the money comes to the bank accounts of the poor, spending will start, which would spur demand and bring back to life thousands of industries which were shut down due to the double impact of demonetization and Goods and Services Tax (GST) brought out by the Bharatiya Janata Party government. "Once industries and factories reopen, the unemployed youth would get gainful employment. Nyay will erase the ill-effects of demonetization and GST, and simultaneously generate jobs which would help the country's economy," Gandhi said. 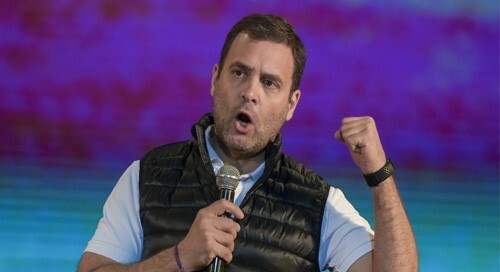 Attacking the BJP, he said the Nyay scheme is different and unique compared to the false promise of Rs 15 lakh announced by Narendra Modi before the 2014 elections. "Where's that promised Rs 15 lakh? Post-demonetisation it was the poor who stood in the queues, not the affluent classes having black money... the government took away all the cash from the economy and then cleared the debts worth Rs.3.50 lakh crore of the big industrialistsa" he said. Gandhi said PM Modi can never work for the poor as he has no regards for them, since his sympathies lie with the 15 top industrialists for whom he works. Targeting the PM, the Congress chief said Modi always claims that senior BJP leader L. K. Advani is his aguru', but he (Modi) has never respected him and virtually driven him out of the party. "The BJP has no culture of respecting its senior leaders. Hinduism has a rich tradition of 'Guru-Shishya' but today those who speak of Hindutva have no regard for their party elders," Gandhi declared. Tackling issues of defence deals, poverty, unemployment, economic crisis and others, he said PM Modi "can only be a chowkidar for the rich" and has money to write off their debts, but no funds to clear the loans of the poor farmers in the country. Present on the occasion were senior Congress leaders and representatives of several parties in the 56-party 'mahagathbandhan' in the state at the rally in Chandrapur in eastern Maharashtra's Vidarbha region.